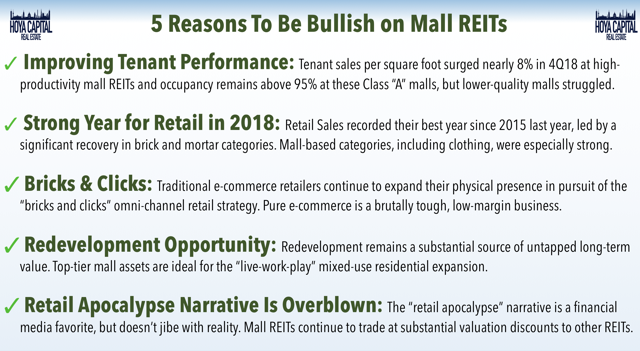 Despite the strongest year of retail sales growth since 2015 and a 30% decline in store closings, mall REITs continued to skid in 2018. Excluding Simon, the sector plunged 32%. The bifurcation between top-tier and lower-tier mall REITs continues to widen. Store closings remain elevated in low-productivity properties and the outlook for these weaker malls remains weak. A new and unexpected bifurcation has emerged: between REITs and their tenants. High-productivity malls reported a 7.8% rise in tenant sales per square feet in 4Q18, but just a 1.1% rise in same-store NOI growth. For high-productivity malls, however, the metrics are stronger than the stock performance suggests. Occupancy remains around 95% and leasing spreads averaged 10% in 2018 as the long-term outlook remains solid. Lower-productivity mall REITs appear to be a recession away from the end. That said, another half a decade of solid economic growth could be enough to turn it all around. In our REIT Rankings series, we analyze each of the commercial and residential real estate sectors. We evaluate REITs within the sectors based on both common and unique valuation metrics, presenting investors with numerous options that fit their own investing style and risk/return objectives, and update these reports every quarter with new developments. Mall REITs comprise roughly 8-10% of the REIT Indexes (VNQ and IYR). 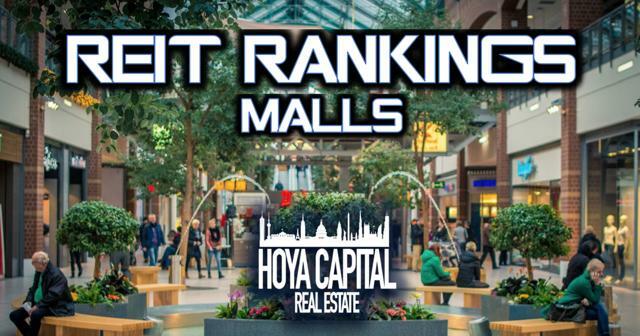 In the Hoya Capital Mall REIT Index, we track the seven mall REITs, which account for roughly $70 billion in market value: CBL & Associates (CBL), Macerich Co. (MAC), Pennsylvania REIT (PEI), Simon Property Group (SPG), Tanger Factory Outlet Centers (SKT), Taubman Centers (TCO), and Washington Prime Group (WPG). Investors looking to invest in the retail REIT sector through a pure-play ETF can do so through the Pacer Benchmark Retail REIT ETF (RTL). REITs own the majority of malls in the United States, and thus, hold a disproportionately high weighting in the market-cap weighted REIT indexes. Simon Property Group itself accounts for 80% of the aggregate market cap of the mall REIT sector. After a development boom during the 1990s and early 2000s, very little new retail space has been created since the recession. Despite that, the US still has more retail square footage than any other country in the world. 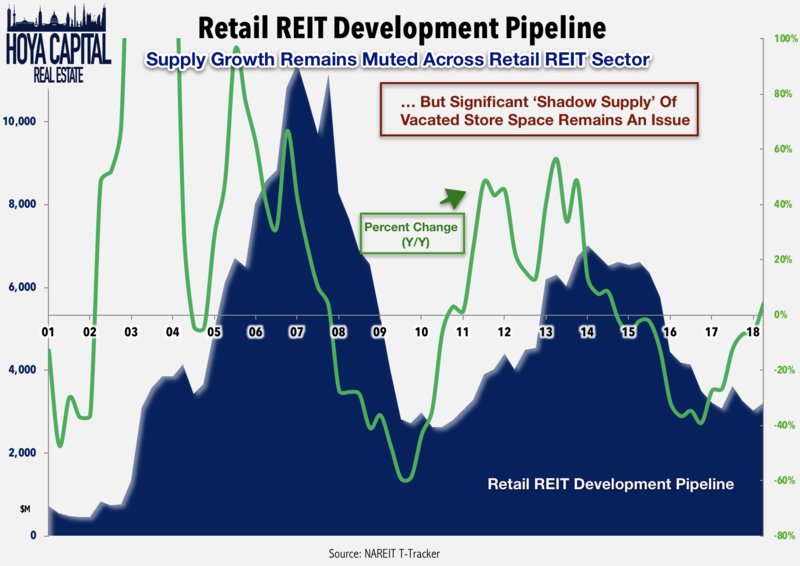 Elevated levels of store closings in recent years, spurred by the rise of e-commerce, has created ample "shadow supply" of recently vacated space which has negatively impacted retail REIT fundamentals. 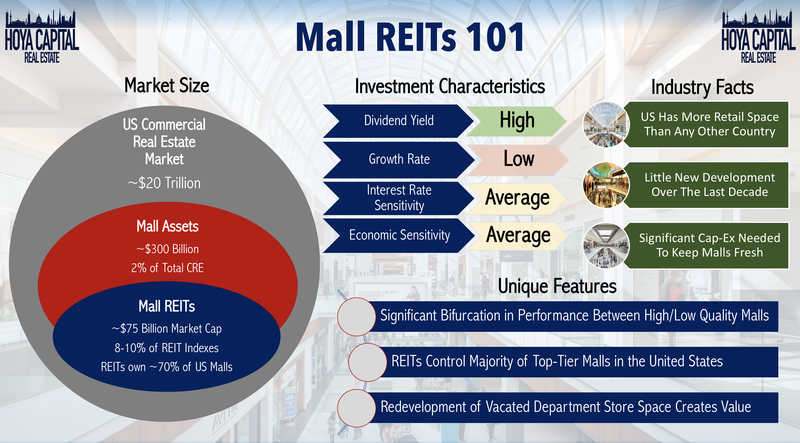 Above, we note the characteristics and strategy of each mall REIT. 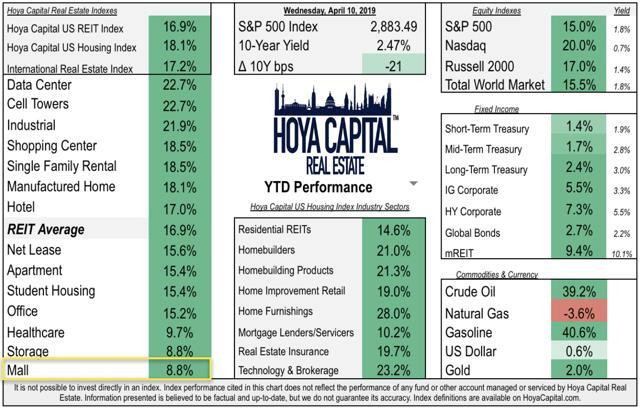 More than other sectors, it's critical to note the "quality focus" of these REITs. There has been a significant divergence in fundamentals and stock performance between higher-productivity malls and lower-productivity malls since the end of the recession. Top-tier malls, as measured by tenant sales per square foot, continue to perform well across most metrics, including tenant sales, average rent, and occupancy. 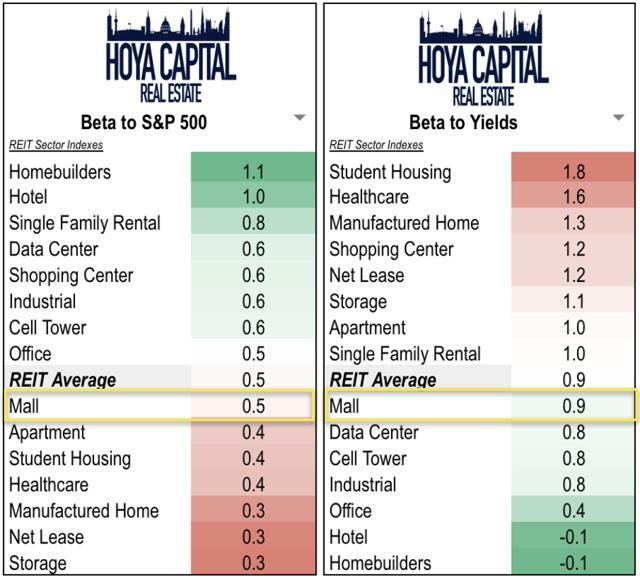 2019 guidance provided by these REITs projects a further widening in same-store growth metrics. Powered by tax cuts and a robust labor market, 2018 was the best year for total retail sales since 2012 and the best year for "brick and mortar" since 2015. While online sales continue to take incremental market share, more retailers have embraced the "brick and clicks" omnichannel retail strategy including e-commerce giant Amazon (NASDAQ:AMZN). High-productivity mall REITs continue to find accretive yields in redeveloping vacated department store space into higher-value mixed uses, including multifamily and experience-based retailers. 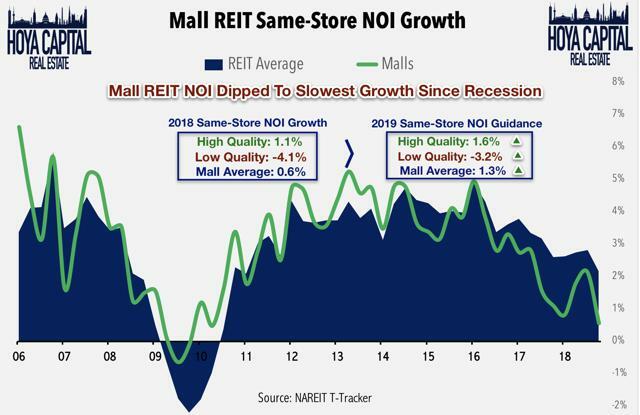 Mall REITs, even the higher-productivity malls, have traded at persistent valuation discounts over the past half-decade, fueled by the largely false "retail apocalypse" narrative. 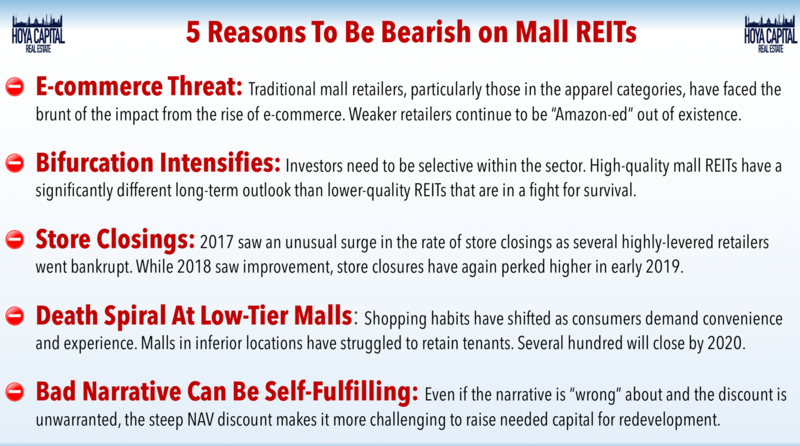 While the "retail apocalypse" may have been exaggerated, retail REITs continue to be challenged by broader secular headwinds. Downsizing retailers have focused their investment into higher-performing stores and have continued to close weaker-performing stores in lower-tier malls and retail centers. 2017 saw an unusual surge in the rate of store closings, but total closings dropped 20% in 2018 before reaccelerating yet again in the early part of 2019. Lower-productivity mall REITs are in a continual fight for survival and funding concerns are expected to be lingering issues for the foreseeable future. As discussed above, the bifurcation between top-tier and lower-tier mall REITs continues to widen. A new and unexpected bifurcation has emerged: between REITs and their tenants. High-productivity malls reported a 7.8% rise in tenant sales per square feet in 4Q18, but just a 1.1% rise in same-store NOI growth. Certainly, there is survivorship bias in the tenant sales figures, but the strong holiday season is both a welcome relief and a potential new concern, as the REIT-level metrics including 2019 guidance barely budged after a record holiday shopping season. That said, the leasing spreads of all seven REITs did accelerate from last quarter and still average nearly 10% across the three high-productivity mall REITs while occupancy costs improved across the five REITs that report that data. The lower-productivity REITs, however, continue to see declining fundamentals. Pennsylvania, CBL, Washington Prime, and Tanger combined to report an average of just 1.9% growth in tenant sales per square foot and a -4.1% decline in same-store NOI. Most concerning is the continued decline in leasing spreads, which are a leading indicator of same-store NOI performance, and which averaged a disappointing -3.2% in 4Q18, which was actually an improvement from the -4.6% rate recorded in 3Q18. It's clear that these REITs are focusing on maintaining occupancy and are willing to make concessions with retailers, as occupancy held steady at 94%. A sharp disconnect has persisted between private market valuations of malls and the REIT-implied valuation, at least on paper. With only 1,000 malls in the US, and REITs owning the majority of them, there are only a few transactions per year to confirm or deny the estimated private market valuations. 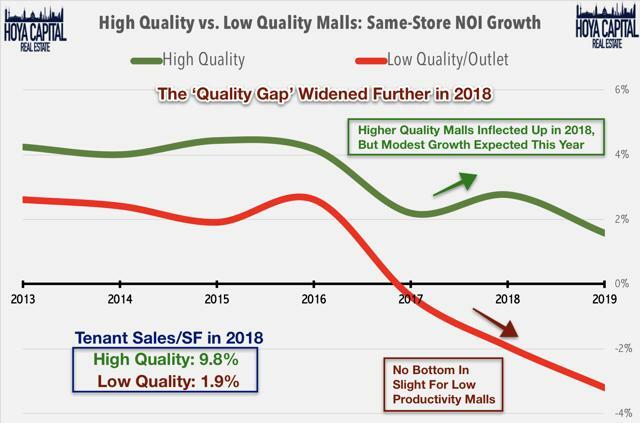 Analyst consensus is that lower-quality mall assets have depreciated 20-40% over the past three years, while higher-quality asset valuations have remained relatively flat. Mall REITs now trade at an estimated 10-20% discount to private market values, on average, with the lower-productivity malls trading at a 0-50% discount depending on the assumptions used. The persistent NAV discount has forced these REITs to be net sellers since the end of 2015. The saving grace of the retail REIT sector over the past half a decade has been record-low new development. Significant amounts "shadow supply" from recent and future store closings persist across the sector, however. New supply growth has averaged less than 0.5% of existing stock per year since the recession, helping the industry absorb this ample "shadow supply" from vacated stores. For several mall REITs, particularly Simon and Taubman, redevelopment remains a substantial source of untapped long-term value. Top-tier mall assets are ideal for the “live-work-play” mixed-use residential expansion and there are a handful of highly successful redevelopments from these two higher-productivity REITs. After reaching the fastest rate of growth since 2012 in the middle of last year, retail sales growth has generally moderated over the past several months and data was mixed in March. On a trailing-twelve-month basis, total retail sales slowed to 4.6%, retreating from the 5.5% peak rate achieved in August. Non-store (e-commerce) retail sales slowed to the slowest rate in two years. 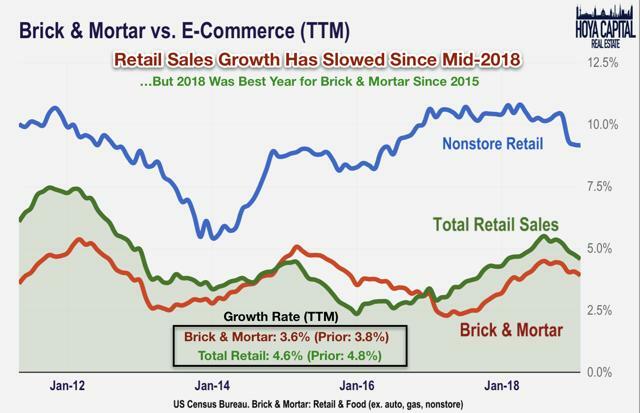 Even with the weak end to 2018, the brick-and-mortar retail category grew at the strongest full-year rate since 2015. While hardline and food retailers tend to be somewhat immune from e-commerce related disruption, softline and specialty retail categories are generally more at risk. 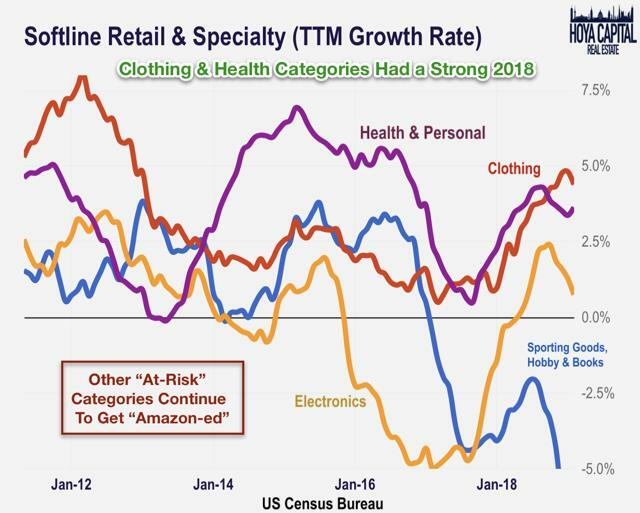 During the so-called "retail apocalypse" of 2016-2017, these categories were particularly weak but have recovered nicely since early 2018. Clothing, in particular, grew at the fastest rate since 2012 while electronics also recovered following several years of considerable weakness. The pain continues for the largely-mall-based hobby, sporting goods, and book stores which continue to get "Amazon-ed" out of existence. The rate of e-commerce market share growth is particularly relevant to the retail REIT sectors, as well as the flip-side of the coin, the logistics and distribution-focused industrial REIT sectors which stand to benefit from growth in e-commerce, which we discussed in our recent report, Industrial REITs: Not Tired of Winning. E-commerce remains a relatively small slice of total retail sales at roughly 10%, but represents nearly 20% of at-risk categories which exclude automotive, gas, and food. 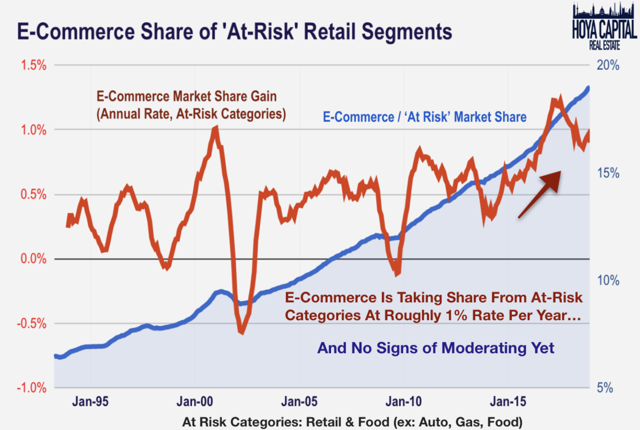 The relevant statistic to watch, in our view, is the rate of e-commerce market share gains. From 2013 to 2016, e-commerce market share gains were accelerating, corresponding with calls for the retail apocalypse, but have moderated over the last two years as brick-and-mortar retailers found relatively more success in attracting customers through the doors. Elevated levels of store closings continue to be an issue, though, as just a handful of retailers are in growth mode amid a broader trend of rationalization of their brick-and-mortar presence. While some traditional e-commerce firms have increased their presence in the brick-and-mortar space over the past several years, especially at higher-productivity locations, these gains have been more than offset by losses at other retailers at lower-productivity malls and shopping centers. 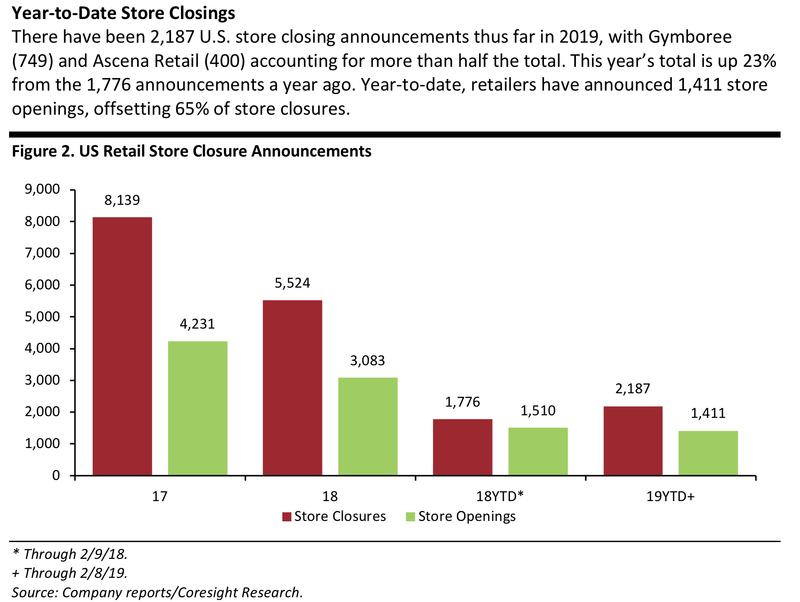 According to Coresight Research, a retail analytics firm, store closings were down more than 30% in 2018, but have reaccelerated in 2019. The near-perfect state of U.S. employment, income, and GDP has led many to conclude that the current environment represents “peak retail,” i.e., this is the best environment that retail sales can experience within the constraints of the U.S. economy... Despite this near-ideal environment, its benefits are not being enjoyed equally, with some retailers flourishing and others languishing... The flood of store closures will likely continue for quite some time. 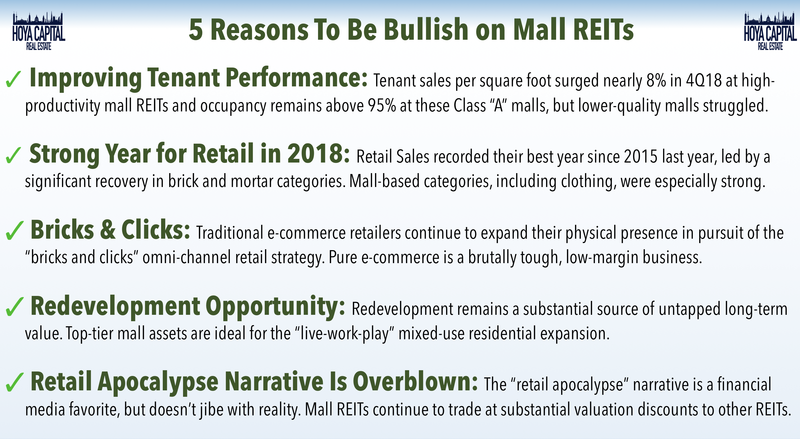 Despite the strongest year of retail sales growth since 2015 and a 30% decline in store closings, mall REITs continued to skid in 2018. Excluding Simon, the sector plunged an average of 32%, but due to the 80% market capitalization weight of the company, the sector only recorded a 7% dip last year. 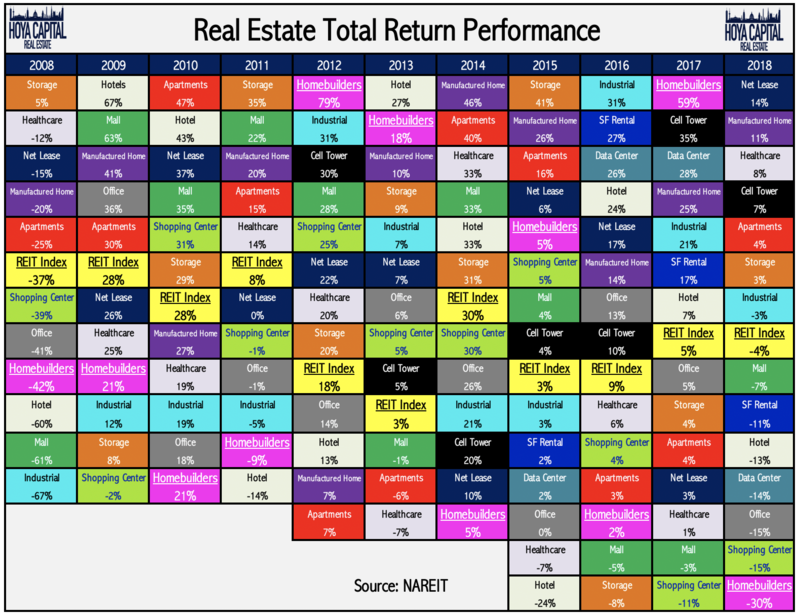 Mall REIT delivered strong performance in the immediate aftermath of the recession, but have been relative underperformers in the REIT sector since the start of 2016. 2019 hasn't been much better for the mall REIT sector. 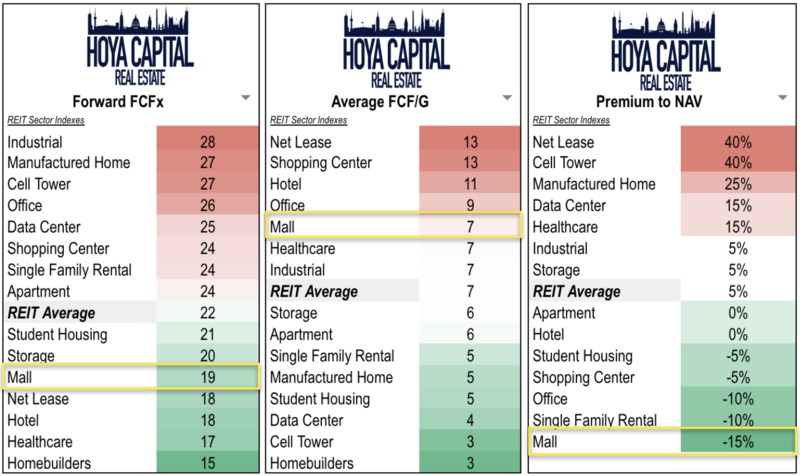 The Hoya Capital Mall REIT Index is the weakest-performing real estate sector, returning just 9% so far this year compared to the 17% jump in the broader REIT index and a 15% climb in the S&P 500. Further highlighting the relative underperformance of mall REITs versus their tenants, the SPDR S&P Retail ETF (XRT) is higher by more than 17% on the year. 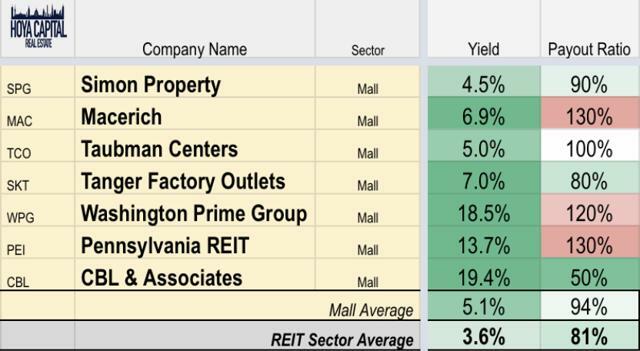 The Mall REIT Index's performance, skewed by the 80% weight of Simon Property Group, masks the significant weakness among the lower-productivity mall REITs. Simon returned a relatively strong 4% in 2018, higher than the broader REIT average of -5%. Outside of Simon, 2018 was a brutal year with CBL and Pennsylvania REIT each losing roughly half of their value. Even higher-productivity mall REITs Macerich and Taubman dipped nearly 30% each. As they have for most of the past half a decade, mall REITs screen as fairly attractive across most traditional REIT metrics. 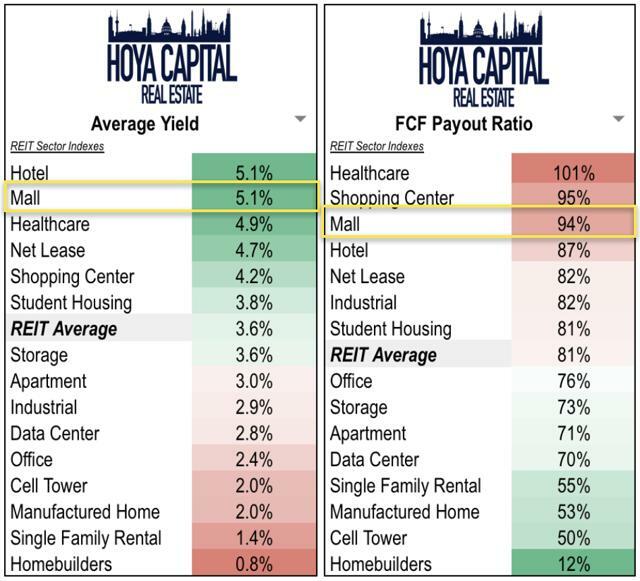 Mall REITs trade at modest relative discounts to Free Cash Flow (aka AFFO, FAD, CAD), but appear less attractive when factoring in growth expectations. Mall REITs trade at the widest NAV discount in the REIT sector at roughly 10-20%. But as discussed, with the limited number of private market transactions, estimates vary widely. Based on dividend yield, mall REITs rank towards the top, paying an average yield of 5.1% compared to the REIT average closer to 3.6%. They pay out, on average, more than 90% of their available cash flow, above the REIT average of around 80%, leaving just enough capital to fund the redevelopment of existing assets, but leaving little margin for error. Within the sector, more than other REIT sectors, investors need to be cautious not to fall into common "value traps" by assuming that high dividend yields can offset declining price returns. As we've pointed out for the past several years, despite paying double-digit dividend yields, REITs like CBL, PEI, and WPG face strong headwinds and there's certainly no "free lunch" in equity investing. Mall REITs tend to exhibit more growth-like qualities than other real estate sectors and respond favorably to a strong economy regardless of its impact on interest rates. Mall REITs exhibit slightly above-average sensitivity to the equity market and below-average sensitivity to the 10-year Treasury yield. We separate REITs into three categories: Yield REITs, Growth REITs, and Hybrid REITs. As a sector, mall REITs fall into the Growth/Hybrid REIT category. 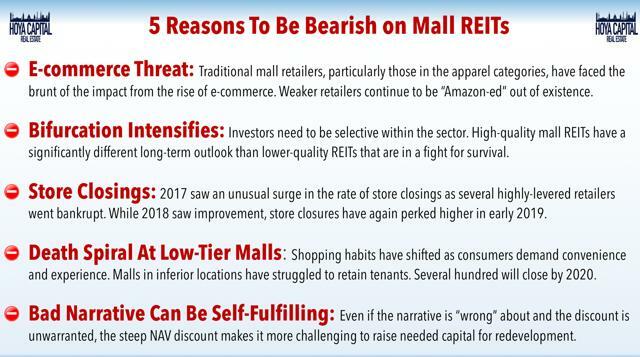 For investors worried about rising interest rates brought about by stronger economic growth, mall REITs may be well suited to outperform. Within the sector, we note that CBL and PEI have more Growth REIT characteristics, while the rest of the sector falls into the Hybrid or Yield REIT category. 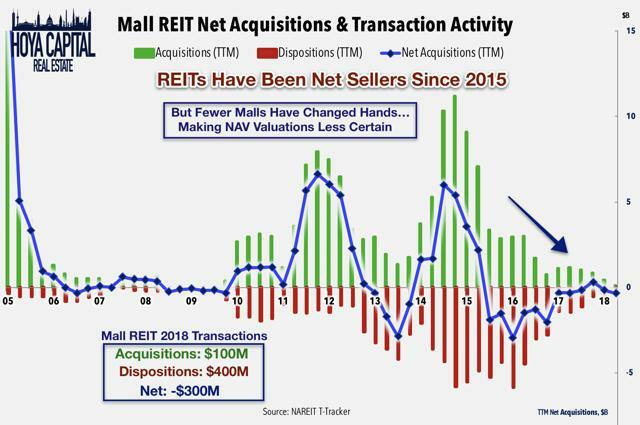 Despite the strongest year of retail sales growth since 2015 and a 30% decline in store closings, mall REITs continued to skid in 2018. Excluding Simon, the sector plunged 32%. The bifurcation between top-tier and lower-tier mall REITs continues to widen. Store closings remain elevated in low-productivity properties and the outlook for these weaker malls remains weak. A new and unexpected bifurcation has emerged: between REITs and their tenants. High-productivity malls reported a 7.8% rise in tenant sales per square feet in 4Q18, but just a 1.1% rise in same-store NOI growth. For high-productivity malls, however, the metrics are stronger than the stock performance suggests. Occupancy remains around 95% and leasing spreads averaged 10% in 2018 and the long-term outlook remains solid. Well-located "destination" retail assets will continue to be an attractive distribution channel for retailers, even in a world where e-commerce market share gains continue indefinitely. Lower-productivity mall REITs appear to be a recession away from the end. For their tenants, with rising wages and continued price competition, the operating environment will remain tough and simply lowering rents is not enough to retain tenants. That said, another half a decade of strong economic growth could be enough to turn it all around and could make their deep-value investors look like wizards. While there is a place in a portfolio for speculative names, REIT investors looking to play it safe are limited to one to three high-quality names for the foreseeable future. If you enjoyed this report, be sure to follow our page to stay up-to-date on the latest developments in the housing and commercial real estate sectors. For an in-depth analysis of all real estate sectors, be sure to check out all of our quarterly reports: Industrial, Data Center, Net Lease, Manufactured Housing, Student Housing, Single-Family Rentals, Apartments, Cell Towers, Manufactured Housing, Malls, Shopping Centers, Hotels, Office, Healthcare, Storage, and Homebuilders. Disclosure: I am/we are long VNQ, SPG, TCO. I wrote this article myself, and it expresses my own opinions. I am not receiving compensation for it (other than from Seeking Alpha). I have no business relationship with any company whose stock is mentioned in this article.